I’ve discovered that I have a real affinity for leather wallets. They’re flexible, durable, attractive and they smell great. I’ve also discovered an affinity for those wallets that carry my plastic cards vertically rather than horizontally. 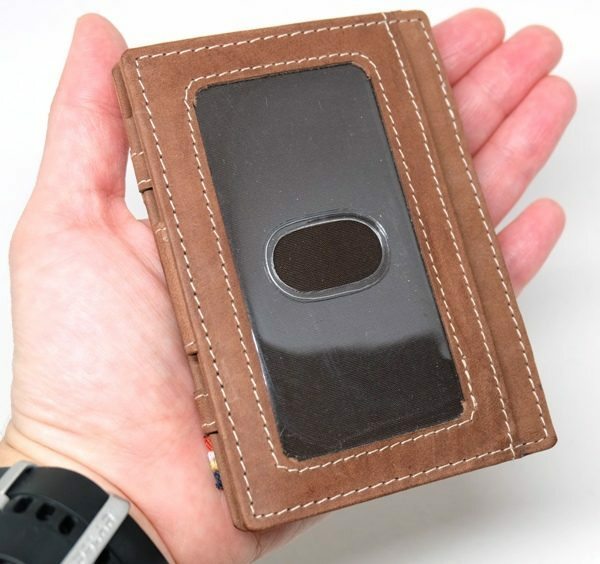 The Riveci Olympus – Bowie Pull-up Brown wallet is such a wallet and I was given the opportunity to review it. 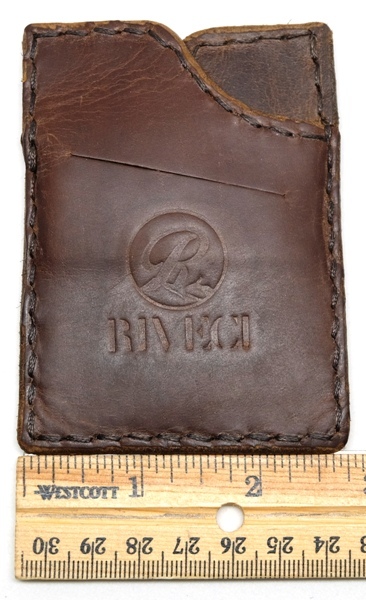 Will this minimalist leather wallet accommodate all that I need? The Riveci Olympus – Bowie Pull-up Brown wallet was sent to me in a metal case that contained batting to protect the wallet. I noticed that when I took the wallet out of the case, the wallet’s seams were coated in an oily substance. It took me by surprise because I didn’t notice it before I started handling the wallet and thus my hands were then coated with the same substance. I have well-oiled hands now. 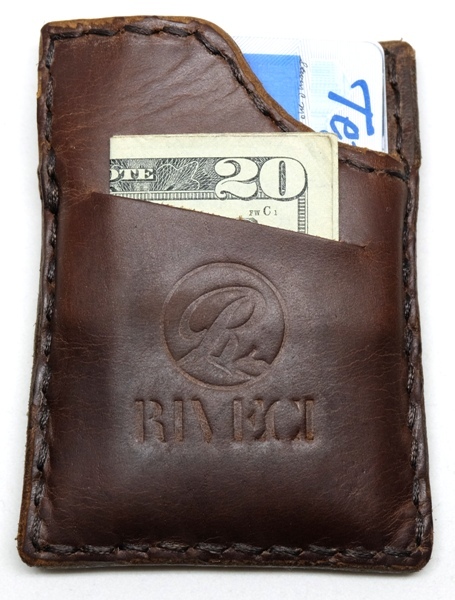 The Riveci Olympus wallet is a rugged looking full-grain leather wallet made from soft, flexible, pull-up leather. It is handcrafted in the United States using materials “sourced from U.S. vendors”. 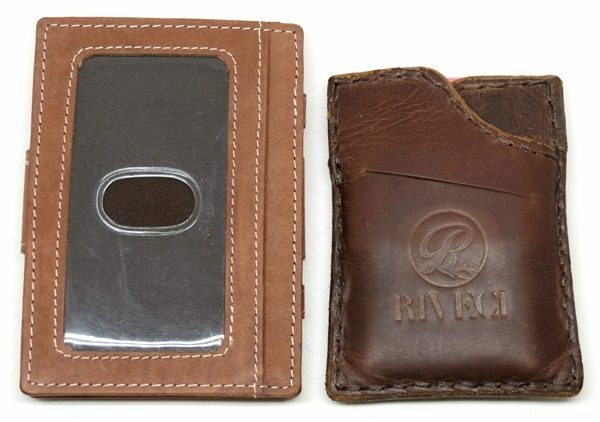 This wallet is rather small measuring only 3.8″ L x 2.8″ W x.25″ D. It has a money slot in the front (the slit in the front of the wallet) and the front pocket has a curved opening to allow you quick access to your credit cards. 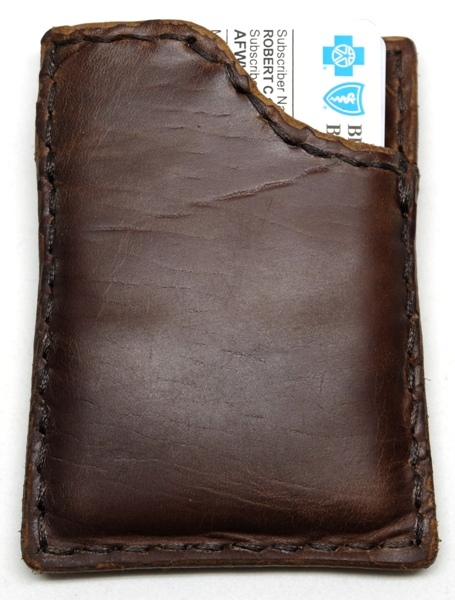 The jagged burnished edges and slightly uneven stitching make the wallet look like it is purposely made to look handmade. 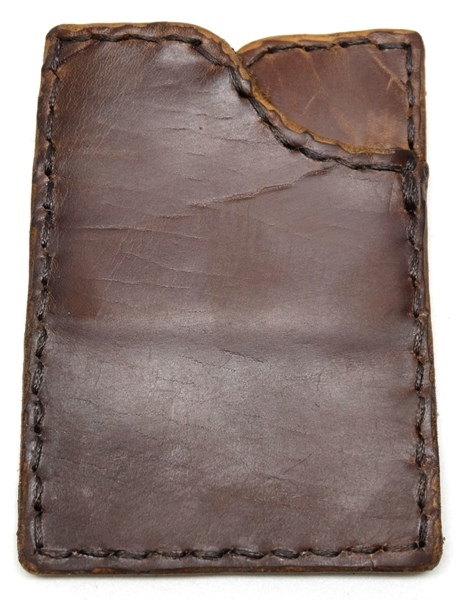 a waxy or oiled-finished leather. These leathers lighten when stretched, bent, or “pulled up”. They are categorized as natural because they do not have a thick top coat. They have a nice hand, and develop a unique distressed look with time. The leather also felt more “stretchy” than other leather items I have used. The thick thread felt waxed and the stitch length was rather long (I tend to prefer a smaller, tighter stitch), but this seems consistent with its styling. The back of the wallet shows the last slot. It too has a curved opening to allow quick access to your cards. It is difficult to tell in the photo above but there was one stitch that was loose – the “tie off” or finishing stitch (located along the right edge of the wallet in the above photo at the corner of the curved edge of the back piece of leather) which makes me question how long the stitching will last. 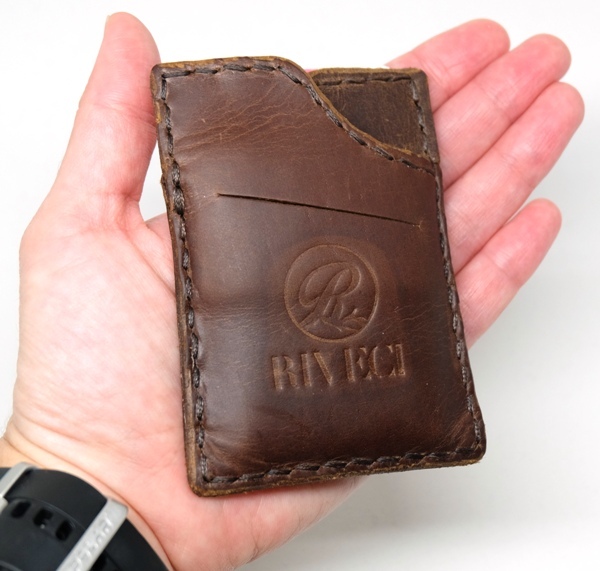 The Riveci wallets only have a two-year warranty on them. 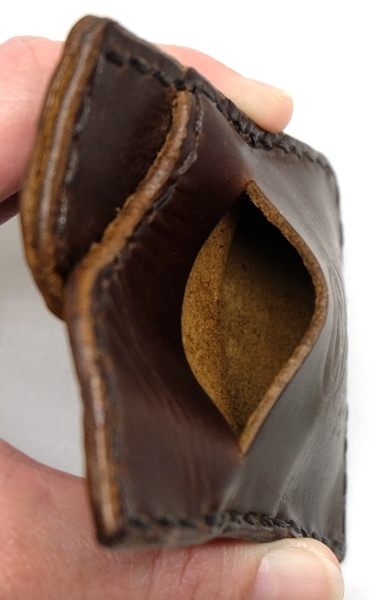 Empty, the wallet is around 0.7 cm. 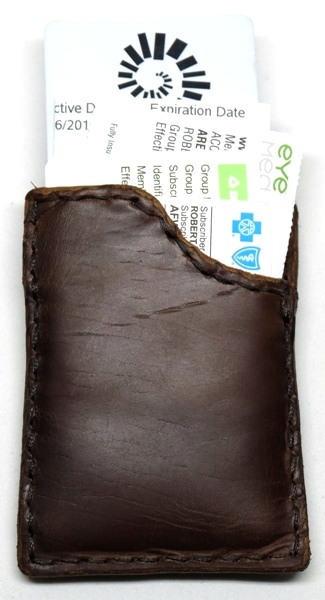 I like that the wallet is made of thicker leather (their specs say it is made from 4 oz leather which is 1.6 mm thick). It makes it feel more robust. None of the pockets are lined with any material. 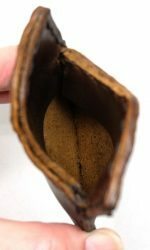 The interior of the last pocket (the third photo above) shows how only the top portion of the piece of leather that divides the two main pockets is sewn into the seams of the wallet, the lower portion of which is not sewn in – perhaps to avoid adding too much bulk to the edge of the wallet. I was able to fill the money slot with one $20 bill (I could have put more in there, but that’s all the cash I had at the time), and the front pocket with four plastic cards. The back pocket I filled with one plastic card and four paper cards (which are the size of credit cards). The wallet contains all of these cards perfectly. If, however, I insert a business card into the wallet, the card is slightly taller than all of my other cards, thus it might be beneficial to make the wallet 2 mm longer for those who would like to use this wallet for business/customer appreciation cards. I don’t tend to like having all my cards inserted into one or two pockets because they are not organized and easily accessible which means that I then have to dig into the wallet to search for the appropriate card when necessary. However, I rather liked how compact the wallet is after being stuffed with all that I deemed necessary to carry. I also liked the cracked distressed appearance and pull-up effect of the leather (lighter color in the stretched areas) after placing my cards into the wallet. 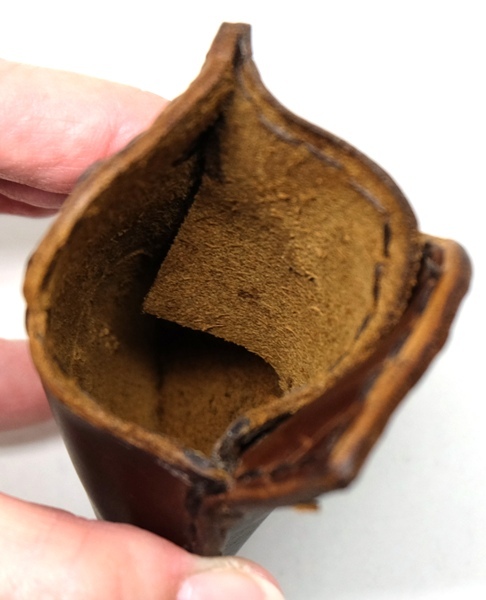 Rubbing over the stretched area with your hands or fingers will often rub out the lighter color of the stretched leather if desired. The thickness of the wallet remained fairly compact (in my opinion) especially with all the cards I placed in it (a little less than 0.75″ thick). When compared to my Garzini Essenziale Finestra wallet, the Riveci Olympus wallet is small indeed. It’s even noticeably smaller in my hand. The Riveci Olympus – Bowie Pull-up brown wallet grew on me as I continued to use it, so much so, that I like it almost as much as my current Garzini Essenziale Finestra wallet. I was a little concerned about the one loose “tie off” or finishing stitch and the wide stitch length – wondering if the stitching will last, especially since the wallet only has a two-year warranty. But the fact that the wallet is small and compact yet stretches to fit five plastic cards and four paper cards, as well as a $20 bill, was very appealing. It also has rugged good looks with its cracked distressed appearance and pull-up effects. I’m not sure that I will use it as my everyday wallet, but it seems to function well as my coupon/customer appreciation card (I had to trim these down to fit into the wallet)/bandaid wallet which I use frequently. Time will tell how long this wallet will last and since it is $48.95, which is a little expensive for me, I’m hoping it will last a very long time. 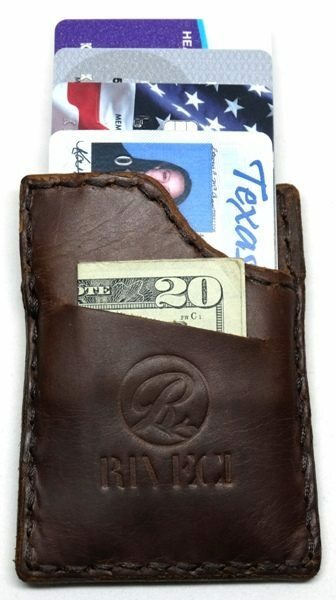 After learning a great deal more about high-quality leather and leather products, I find that this wallet is not quite up to par with wallets like the Benjamin Bott Design Benjamin Bott Design Chickadee English Tan ultra minimalist wallet. 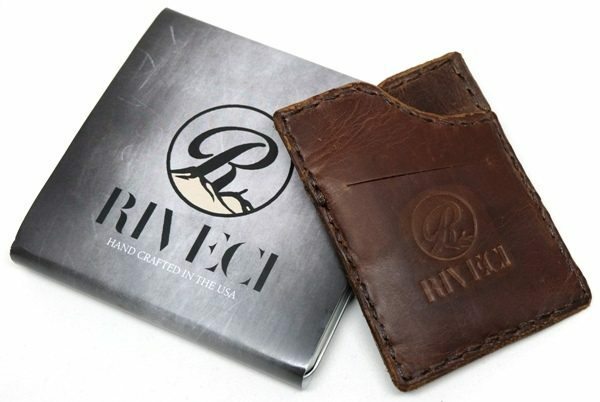 The Riveci wallet’s leather does not have a premium leather feel to it and the wallet itself is not as well made. 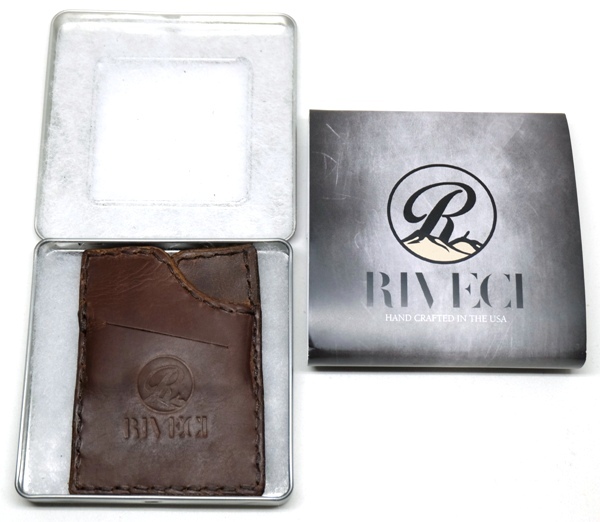 In addition, the Riveci wallet has only a two-year warranty and the Benjamin Bott wallet has a lifetime warranty. Source: The sample used in this review was provided by Riveci. Please visit their website for more information or to purchase one.